Sunday night. I’m lying in bed. Hot. Very hot. Then I hear a high pitched buzzing. A mosquito. I wasn’t willing to ignore it and go to sleep. If I did, I may as well garnish my body with relish and write ‘Bon appetite’ on my face. Besides which, I didn’t really want to risk catching malaria – a disease increasingly common amongst African football players. I had to get up and deal with it. I turned the light on, but couldn’t find the little bugger anywhere. Then, from behind the door, the carnivorous insect flew straight towards me. Armed with a can of fly killer, I sprayed it. It was no more. I went back to bed. Moments later, as if from a horror film, it came back – this time, within touching distance of my face. I trapped it in the corner and unleashed half a can of Raid Insect Killer onto it. It lay dying on my bedside table buzzing around. That’s when it got crushed. Asta la vista, baby! MwaHaHaHa! Summer finally arrived this weekend, and instead of giving us some nice warm days and cool evenings; the weatherman decided to incinerate the whole country, causing blood to boil and skin to fall off well cooked flesh and bones. OK, that may have been a slight exaggeration, but it has been very, very hot. Things weren’t helped either by some local kids, who, for some bizarre reason, feel the need to get up at 7am and play outside in their garden. When I say ‘play’, I mean ‘pretended to murder each other’. I have to sleep with my bedroom window open because of the heat, but am then awakened to screaming, crying children. 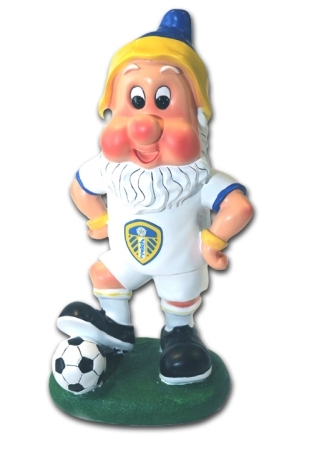 Buy your limited edition Ken Bates garden gnome now! My return to Twerton Park last night was everything I had hoped for. I got my new shirt (which is superb), became reacquainted with friends from last season, drank City Ale (Bath Gem to those not in the know) and watched a great bit of pre-season footy with my girlfriend. 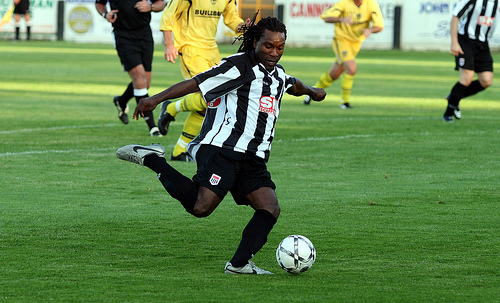 The new signings impressed me; especially Stuart Douglas – not to be confused with Edgar Davids, however good he may be! After meeting ‘Dougy’ in the clubhouse at fulltime, I found he’s not only a great footballer, but a top bloke too!